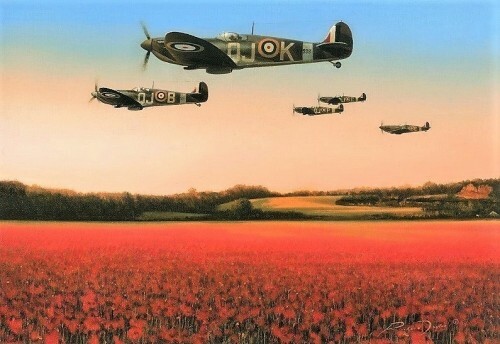 The Battle of Britain had been won by the young fighter pilots of Fighter Command, but now it fell to another band of young men to wage total warfare against the Nazi war machine – the aircrew of RAF Bomber Command. 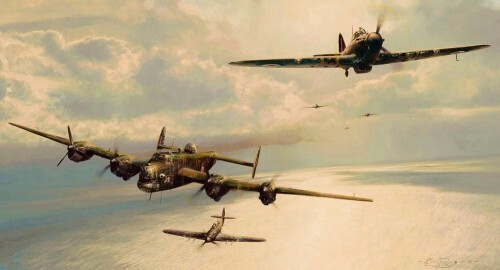 The Battle of Britain had been won by the young fighter pilots of Fighter Command, but now it fell to another band of young men to wage total warfare against the Nazi war machine – the aircrew of RAF Bomber Command. A lone Halifax of 405 Sqn RCAF struggles home the hard way – damaged and alone. One of the aircraft’s engines is already out and another is smoking badly as the exhausted pilot and his crew fight to keep their unwieldy bomber airborne. 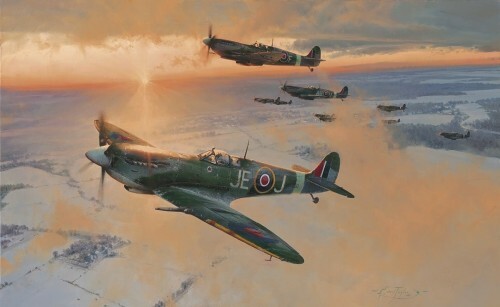 Any marauding Luftwaffe fighters would have found them easy prey, but fortunately they have been spotted by a formation of Hurricanes from 253 Sqn on a routine patrol. For that final leg of their long journey this crew will at last have protection to see them safely back to base. Like the fighter pilots of the Battle of Britain, the young men who flew with Bomber Command came not just from Britain, but from all over the Commonwealth and countries of occupied mainland Europe. Every man was a volunteer, prepared to endure the deadly flak and prowling night-fighters, to say nothing of the savage and bitter cold, in order to wage their relentless attack against the Third Reich. 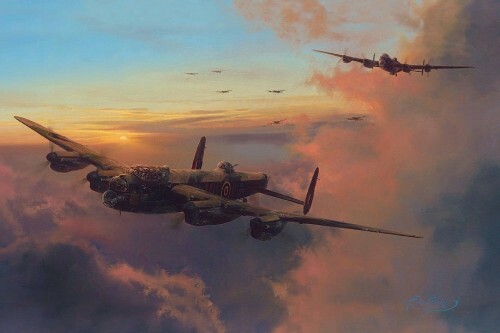 Bearing the brunt of the RAF’s incessant campaign were two heavy bombers, the stalwarts of Bomber Command – the Lancaster and the Halifax. Between them they accounted for over three-quarters of all the bombs dropped by the RAF, and Halifaxes alone accounted for a total of 73,312 operations, nearly a fifth of all missions carried out by Bomber Command. 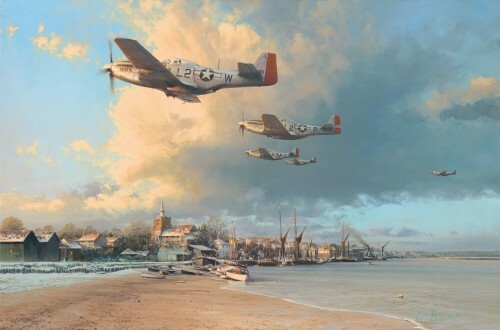 Each print in the FOUR signature Limited Edition is personally signed by artist Robert Taylor, and individually hand-numbered; together with TWO RAF aircrew who flew Halifaxes during WWII, and TWO Hurricane fighter pilots.